Our paper, Supply Chain Network Operations Management of a Blood Banking System with Cost and Risk Minimization, Anna Nagurney, Amir H. Masoumi, and Min Yu, now appears in the journal, Computational Management Science 9(2): (2012) pp 205-231. It is in the April 2012 issue of Computational Management Science and is in a special issue edited by Professor Georg Pflug. In this paper, we focus on a specific perishable product – that of human blood – and the optimization of a blood banking network system. Nahmias (1982) claimed that: “The interest among researchers in perishable inventory problems has been sparked primarily by problems of blood bank management. Some of the possible reasons for this interest might be that blood bank research has been supported by public funds.” Prastacos (1984) provided a review, to that date, of blood inventory management, from both theoretical and practical perspectives. Whether or not Nahmias’ statement is still valid – considering all the recent concerns about the safety of perishable products, blood bank management from a supply chain network perspective merits a fresh and updated approach. This topic is especially timely today, since it has been reported that the number of disasters and the number of people affected by disasters has been growing over the past decade and blood is certainly a life-saving product (cf. Nagurney and Qiang (2009)). 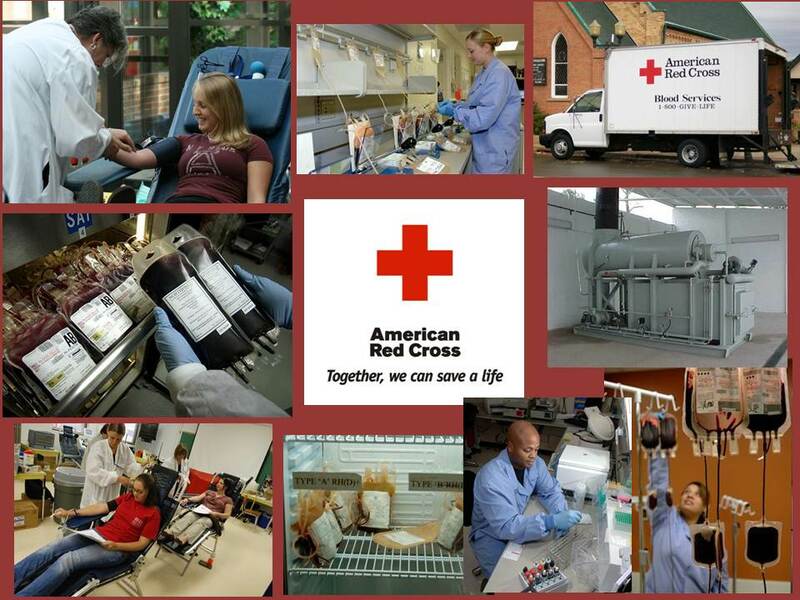 Blood service operations are a key component of the healthcare system all over the world. 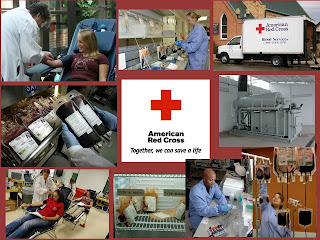 According to the American Red Cross, over 39,000 donations are needed everyday in the United States, alone, and the blood supply is frequently reported to be just 2 days away from running out. Of 1,700 hospitals participating in a survey in 2007, a total of 492 reported cancellations of elective surgeries on one or more days due to blood shortages. While for many hospitals, the reported number of blood-related delays was not significant, hospitals with as many days of surgical delays as 50 or even 120 have been observed. Furthermore, in 2006, the national estimate for the number of units of whole blood and all components outdated by blood centers and hospitals was 1,276,000 out of 15,688,000 units (Whitaker et al. (2007)). Considering also the ever-increasing hospital cost of a unit of red blood cells with a 6.4% increase from 2005 to 2007 further highlights the criticality of this perishable, lifesaving product. In the US, this criticality has become more of an issue in the Northeastern and Southwestern states since this cost is meaningfully higher compared to that of the Southeastern and Central states. Moreover, hospitals were responsible for approximately 90% of the outdates, with this volume of medical waste imposing discarding costs to the already financially-stressed hospitals (The New York Times (2010)). In this paper, we developed a generalized network optimization model for the complex supply chain of human blood, which is a life-saving, perishable product. In particular, we considered a regionalized blood banking system consisting of collection sites, testing and processing facilities, storage facilities, distribution centers, as well as points of demand, which, typically, include hospitals. Our multicriteria system-optimization approach on generalized networks with arc multipliers captures many of the critical issues associated with blood supply chains such as the determination of the optimal allocations, and the induced supply-side risk, as well as the induced cost of discarding the waste, while satisfying the uncertain demands as closely as possible. 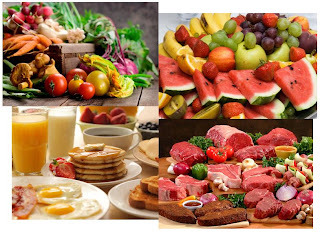 optimization of other supply chains of perishable products. The complete analysis, along with references, can be found in our paper. It's the time of the year when many events are taking place -- from honors and awards banquets to end of the semester parties and the upcoming graduations and celebrations! 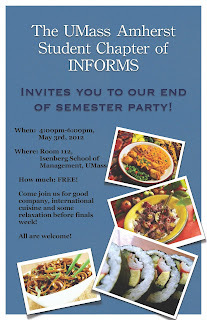 Next week, as has been the long tradition of the UMass Amherst INFORMS Student Chapter, that I have served as the Faculty Advisor of for the past 8 years, we are hosting a party. The information is on the poster below prepared by the students. This is a wonderful event -- you can dine on international cuisine and catch up with colleagues and friends throughout campus and, of course, the Isenberg School of Management. Last evening we had our awards banquet at which students are recognized with awards and also scholarships. The evening was very special and I took the above photos at it. It was very special to meet some of the students' family members and to hear about their numerous accomplishments. Sitting at our table were students who had come to the US 9 years ago and, at a neighboring table, a student who had come from Uzbekistan (and spoke flawless English). I saw several of my Operations Management students who also received awards. Students were recognized for their outstanding academics, for overcoming hardships, for their exemplary service and community work, and internships. An enjoyable time was had by all and the food at the banquet, which took place at the Campus Center, was delicious. Congrats to all the students on their much-deserved recognitions and thanks to the donors! The masters of ceremonies were our Dean, Dr. Mark Fuller, and our head of Development, Mr. Ed Brozman. Tons of work happened behind the scenes to make everything flow smoothly. I am fascinated by math modelling, networks, and the world. Although I teach in a business school and have appointments in engineering I have always enjoyed biology and ecology and, as a freshman at Brown University, even took botany and ecology. I have written about how I became interested in conducting research in ecological modelling, which was due to the intriguing work being done by Dr. Christian Mullon and his colleagues in France. Their research was integrating network economics (and used my book on the topic) with predator prey networks, focusing on fisheries, and used real data. They were exploring climate change and fisheries as well as supply chains. Inspired by their work, I went on to co-write two articles on the topic, including the paper, "Dynamics and Equilibria of Ecological Predator-Prey Networks as Nature's Supply Chains," that was published in Transportation Research E.
Last Fall, in glorious Paris, where I gave a plenary talk at NetGCoop, I had a chance to meet Dr. Mullon and spent a day with him and his lovely wife. This morning, he shared the wonderful news with me. Our paper, "A Game Theoretical Approach to the Vertical Coexistence of Small and Big Fish," has now been accepted for publication in the journal Ecological Modelling. In the paper we construct an abstract model of a pursuit-evasion game using tools from network economics. Animal moves are represented as human migrations: people move to destinations that they find agreeable to migrate to and the associated decision-making depends on the specific characteristics of the location that they come from, the place that they migrate to, the distance between both, but also on the density and the characteristics of the other members of the human population living there. This competitive behavior results in a simple non-cooperative game. The repetition of this game, in turn, yields a dynamical system, the equilibrium of which may be computed using variational inequality tools. These ideas are implemented in the model of a vertical marine ecosystem in which big fish pursue small fish that try to evade, with the small fish preferring to live in surface and with the big fish preferring to reside in depth. The theoretical and computational results suggest that the specific trade-offs for both pursuers and evaders are important for the stability and the permanence of ecosystems. We then discuss how this quite simple model could be a first step towards a game theoretical formalization of the connectivity of marine ecosystems, which is an important and open question in marine ecology. Our paper cites several of my previous papers with Jie Pan, who was one of my former doctoral students, and had attained promotion and tenure at St. Joseph's University in Philadelphia, after receiving his PhD in Math at UMass Amherst. He died of an undiagnosed illness, after even seeking treatment in China, while I was living with my family in Stockholm, Sweden. The paper: Pan, J., Nagurney, A., 1994. Using Markov Chains to Model Human Migration in a Network Equilibrium Framework, Mathematical and Computer Modelling 19 (11), 31-39 is cited as well as a paper that we wrote that was published in the European Journal of Operational Research. We had even published in Operations Research together with Sten Thore. Research is fascinating -- years after you may be applying results to an entirely different discipline and the good work of those who have passed on lives on through the world of ideas! Tonight's episode on the excellent PBS TV series America Revealed is, Electric Nation, and it will be broadcast ET at 10 PM. Our modern electric power grid has been called the biggest and most complex machine in the world – delivering electricity over 200,000 miles of high tension transmission lines. But even though the grid touches almost every aspect of our lives, it’s a system we know very little about. My research group has done research on electric power network systems and also on network vulnerability from transportation systems to supply chains. Episode 1 was on food and episode 2 was on transportation. Next week it will be on manufacturing. I wrote up some of the highlights of the transportation segment. I always say that good news comes in threes, bur rather than waiting and, as a very proud Academic Mom (of 16 students, who have received their PhDs), I will share recent awards that two of my former doctoral students have received for their research. Dr. Jose M. Cruz, who holds 5 degrees from UMass Amherst, including the PhD, has been named an Ackerman Scholar at the University of Connecticut School of Business. Also, Dr. Patrick, Qiang, who also received a PhD from UMass Amherst, and was the recipient of the Charles V. Wootan Award for his dissertation, has received an Early Career Award for his research and scholarship from the Graduate School of Professor Studies at Pennsylvania State University Great Valley. Both Professor Cruz and Professor Qiang are Associates of the Supernetwork Center and information on their dissertations can be found here. Dr. Judith Rodin, the President of the Rockefeller Foundation, has a wonderful OpEd piece on cnn.com, To Prepare for Disasters, Have a Plan B. The article notes the meeting that is being convened in Washington DC this week, Embracing Change: Building Social, Economic, and Environmental Resilience. To alleviate and reduce the impacts of food shortages, financial contagion, natural disasters, as well as pandemics, the world needs to harness the power of networks and synergistic collaborations. This semester, I have been teaching a new course, Humanitarian Logistics and Healthcare. In the course, we have learned about emergency preparedness, mitigation, disaster response and recovery as well as risk management, vulnerability assessment, the importance of critical infrastructure robustness and resilience. We have even discussed fund raising for humanitarian relief organizations. Our guest speakers have come from the Red Cross, the National Guard, and from industry, and we have learned about Disaster Communications, and how universities prepare for emergencies. As a public service, I have now made my lectures notes, as well as several guest speaker talks, available online. This course was inspired by the Humanitarian Logistics: Networks for Africa Workshop that I organized at the Rockefeller Foundation's Bellagio Center on Lake Como, Italy. The findings from the workshop as well as the presentations can be accessed here. Thanks to the Rockefeller Foundation for sponsorship. Our books on related topics can be found here. Last night's episode of America Revealed, Nation on the Move, was on our nation's transportation systems. As a researcher and educator, whose passion has always been networks (and especially transportation and logistics), I knew that this was another PBS TV production that I could not miss. I am also a bit biased, since its host, Yul Kwon, interviewed me in NYC for a video segment on the Braess paradox and gridlock, and the interview is now part of the production's extensive website for education purposes. The segment last night highlighted both private and public transportation and included beautifully filmed segments on school busses, subways, airplanes, and even freight. The graphics were fantastic -- demonstrating dynamically the flows of various transportation modes on the networks. Yul began by saying how he is fascinated by networks and systems and then reported on transportation from airplanes, a traffic reporter's helicopter, and even a school bus in Arizona. I have always loved transportation and my readers know that I got my driver's license (yes, I passed my driver's test in Northampton, MA) only after becoming a Full Professor and a mother. But, then again, growing up in Yonkers, I would walk to public transportation, and ride busses and subways in NYC. As a student at Brown University, and a member of the women's cross country and track teams, I could get to where I needed to by foot (or with friends would take the bus into Boston and ride Amtrak home for holidays). As a faculty member, many of the most interesting places required air travel, and I continue to love flying and collecting conversations and experiences throughout the journeys and my explorations at various destinations. Luckily, now I get invited to speak and usually someone else pays the tab (thank you). I very much enjoyed the freight segment last night, with a focus on Chicago, where Amtrak, commuter trains, and freight trains all have to share the same tracks. I have written about the freight capacity crisis and competition for scarce resources and the U.S. for years has not been devoting the attention and financial resources that our critical infrastructure (especially transportation) needs. America Revealed also captured some of the history of transportation construction in the U.S. with poor decisions made, which now are being undone at much greater costs. My students get it and repeatedly ask me why can't the U.S. have transportation systems with trains and busses similar to parts of Europe?! Having enjoyed the first episode of America Revealed last week, which was on food, I am looking forward to tonight's segment, "America on the Move," which will focus on transportation systems. More information about tonight's show, with video clips, can be found here. Last week, I was interviewed on this production for the PBS affiliate WGBY 57 TV show, Connecting Point. You can view my interview in NYC with Yul Kwon, the host of America Revealed. In that interview I spoke on the Braess paradox and gridlock. Nice to see network systems getting so much attention and generating so much interest! Although I could not be at the INFORMS Conference on Business Analytics & Operations Research Conference that is still taking place in Huntington Beach, California (April 15-17, 2012), one of my Center Associates, Dr. Padma Ramanujam of SAS, is there, and good news travels fast. Yesterday, at the Edelman Awards Competition and Gala, the winner of this year's Edelman Prize (which is considered to be the Academy Award of Business Analytics and Operations Research) was announced. This year's Franz Edelaman winner is TNT Express, the global logistics company! Every week 4.7 million parcels, documents, and pieces of freight must be transported by TNT Express to over 200 countries while maintaining the company's service standards. Until recently, this was done without mathematical support. In 2005 TNT moved to a fact-based decision-making system, the Global Optimization (GO) Program, which uses mathematical modeling. TNT Express routinely uses such tools to enhance its transportation networks, resulting in more efficient routes and lower mileage. "We are delighted to receive this award, which testifies to the sophistication and efficiency of TNT's operations," said TNT Express Managing Director Global Networks and Operations Chris Goossens. "Using operations research helps TNT save costs, improve service to customers and develop managers' skills." The awarded GO program covers multiple aspects of TNT's operations, including site location planning, optimal truck routing, fleet management and staff scheduling. TNT Express carried out 200 network optimisation projects in 2011. Since 2005, TNT Express has saved 60 million kilometres of mileage and 54 million kg of CO2 emissions by optimising its domestic networks in Germany, France, Spain and Italy. Isn't it wonderful to see network optimization, and the powerful tools of operations research, not only helping businesses but also the world by reducing the associated carbon imprint! Congrats to TNT Express and to all the Edelman Prize finalists for showing the way -- doing good business can also mean being green. Plus, just last week, in my Humanitarian Logistics and Healthcare class, I spoke about TNT Express and the World Food Program and how they had worked together, as well as on corporate social responsibility. A few years ago (back in 2005) I was approached by a Canadian film producer to partner on a National Science Foundation (NSF) preproposal to develop an IMAX movie on transportation through the prism of railroads and supernetworks. How could I possible refuse an invitation such as this? Sadly, what we wrote up did not get recommended for further review so I filed away what we had written up and periodically would think -- what if we had been able to do a movie together?! A few weeks ago, I was going over some of my files and happened to come across our proposal and memories came flooding back. Since I was born in Canada I do have a soft spot for Canadians and, given my research, all forms of transportation and network problems. 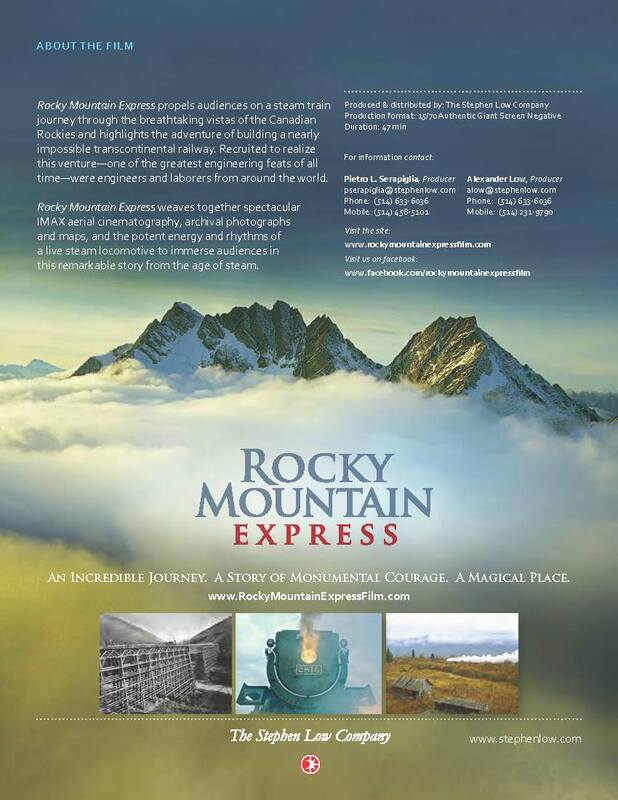 Today, I received a message from Alexander Low (my Co-PI on the preproposal) and, in his message, he said that he and his brother, Stephen Low, did produce an IMAX railway film, "Rocky Mountain Express." It is a steam train journey through the Canadian Rockies that relates the epic story of the building of the Canadian Pacific Railroad. The image above is from a brochure that Alexander forwarded to me. The film is now playing in a few markets in the US (including Chicago) and in the Hague in Europe. More information on the movie and where it is showing is available here. I look forward to seeing it and congratulations to the Lows for this stunning and educational production! Perhaps there will be an opportunity to work on a project on sustainable transportation in the not too distant future. I have read the rave reviews of this film with some viewers coming back over half a dozen times! Given that my husband is an avid railfan and collector of model trains, this will definitely be a family excursion. Perhaps it is also time to take a train across Canada! Next week, the students in my Humanitarian Logistics and Healthcare course will be giving their team project presentations, which I am very much looking forward to. Several have elected to focus on evacuation networks and are conducting interviews in hospitals and even prison facilities. We have learned a lot in this course this semester and have emphasized all phases of disasters from mitigation and preparedness to recovery and reconstruction and have spent a lot of time on emergency preparedness. I have brought in outstanding speakers to educate and inform and we have learned about such essential issues as information gathering and disaster communications, collaboration, and even the role of transportation in disasters. There is a shocking article in the USA Today about the lack of disaster preparedness in nursing homes. I hope that this very important issue gets the attention that it deserves, especially since most of the residents of nursing homes are women in their 80s and helpless to varying degrees. I plan on posting soon my lecture notes for my new course since I believe that, in doing so, I will be not only be doing a public service, but also helping to educate others on these very important topics. The POMS (Production and Operations Management Society) Annual Conference takes place next week in Chicago, Illinois, April 20-23, 2012. The theme of this year's conference is Socially Responsible Operations. Global supply chain network competition under exchange rate uncertainty (Z. Liu). Also, my doctoral student, Amir H. Masoumi, will be taking part in the POMS Doctoral Student Colloquium and Zugang Liu will be taking part in the Emerging Scholars Program. Amir will also be at the mini-conference on Humanitarian Operations and Crisis Management next Thursday in Chicago. I am sure that the Chicago POMS Conference will be a great success. My Connecting Point interview with host Carrie Saldo is now online. Thanks to PBS affiliate WGBY 57 for giving me the opportunity to discuss the Braess Paradox, and How It Is Impacting Our World. In the segment, I also speak about the Virtual Center for Supernetworks, the Isenberg School of Management, and my new course Humanitarian Logistics and Healthcare. It is fascinating to see how networks and paradoxes are now captivating the media and the public. Thanks also to the producers of America Revealed for letting me be part of the Transportation segment. At the Isenberg School of Management at UMass Amherst, we have a new initiative in which alums are invited back to the school to share their wisdom with our students (and the faculty as well). This initiative is called Professor for a Day. Today, I had the honor of having Mr. Jim Ettamarna, a graduate of our Operations Management program, come and speak to the students in my Humanitarian Logistics and Healthcare class. Jim had graduated in 1997 and what he has accomplished in 15 years is amazing. He began his career with GE and had stories of having the then CEO Jack Welch (who, by the way, is also a UMass Amherst grad in chemical engineering) in the audience for one of his presentations, and of pedaling a stationary bike next to the present CEO of GE, Jeff Immelt, at 5AM in the morning at the gym. He spoke of how one has to get the job done and to become known as an expert in an area and how one develops leadership skills. His work at GE included bringing the opportunities of online commerce to the fore and this initiative helped him to get into Harvard Business School (HBS) from which he received his MBA. He has worked at McKinsey and was even in the cohort with Chelsea Clinton (and spoke about gatherings in the Austrian Alps). Jim emphasized the value of networking (something which he certainly did at HBS), the importance of communication and analytical skills, and of taking advantage of opportunities and making luck turn to your advantage. He also worked for several years in private equity and spoke about how he helped to turn around several companies and then to sell them at substantial profit. He emphasized the importance of staying fit and healthy and of never burning bridges (he had some terrific stories about how he turned rejections around). Jim spoke about the great faculty at UMass that he had had (this warmed my heart) and how what he learned was useful even ten years down the road. He was inspirational and was an outstanding Professor for a Day. Afterwards, students came to my office to further discuss the numerous ideas and helpful suggestions that they had gotten from his presentation. Thanks to a very successful alum -- as his former Professor, I couldn't be prouder. Moreover, today he gave so much of his wisdom and insights to this new cohort of students, many of whom will be graduating next month. Needless to say, I have been eagerly awaiting the PBS four part series, America Revealed. The first episode aired last evening, and it was on food. The host, Yul Kwon, began by introducing the series and episodes and he noted the importance of networks, which was great! Indeed, through last night's episode to next week's, which will be on transportation, followed, on subsequent Wednesdays, by episodes on energy and manufacturing, we will be educated and entertained in a spectacular way. PBS has even set up webpages for Teachers, which is fantastic and you can view my interview with Yul on the Braess paradox there. The aerial photography and filming are amazing as is Yul's courage (he parachutes out of planes and flies in planes that I would not be brave enough to do so) but, then again, Yul, is the winner of the 2006 Survivor. He may have a fear of heights but when the job needs to be done, he does it. Given that the most recent paper that we wrote was on food supply chains, I was completely captivated last night. The images of the tomatoes and cattle will stay with me for a long time. Congrats to the urban farmers who are greening Detroit as well as to those who, for generations, have continued to feed Americans and beyond. I am very much looking forward to the PBS series America Revealed, which is a four part series uncovering the hidden patterns of economic activities that underpin the US -- from food (tonight's segment at 10PM ET) to transportation (next week), and energy, and manufacturing on subsequent Wednesday nights. The series should be fascinating and I was honored to be videotaped with the host and star of the series, Yul Kwon, on Broadway in NYC for a transportation videoclip on the Braess paradox and gridlock. I was interviewed by Carrie Saldo, the host of the PBS show, Connecting Point, about my experiences with America Revealed and the segment will are tonight on WGBY 57 at 7:30 ET. It is called Braess Paradox, and How It Impacts Our World. I very much enjoyed being interviewed by Carrie Saldo for her evening TV program Connecting Point. A teaser for the segment is here. for which I was interviewed by the host Yul Kwon for the educational videoclip on transportation. It's great to see network research getting a lot of visibility! I enjoyed reading the recent Huffington Post article, Scandinavian Countries Are Happiest on Earth, which was based on the 158-page report, published by Columbia University's Earth Institute, commissioned for the United Nations Conference on Happiness. The goal of the study was to "review the state of happiness in the world today and show how the new science of happiness explains personal and national variations in happiness." Having spent two weeks in Gothenburg, Sweden recently, where I will be on my upcoming sabbatical, I can attest personally to the quality of life there. The healthcare infrastructure is wonderful as is the transportation infrastructure. People get together in cafes and there is a lot of social interaction. Plus, you see all ages walking and biking in the city which has stunning architecture. My family and I have also lived in Stockholm, Sweden, so I have more than one data point on this special Scandinavian country. At the School of Business, Economics and Law at Gothenburg University in Sweden, where I now hold a Visiting Professorship, the faculty and students regularly get together. We looked forward to the basket of fruit arriving on Tuesdays -- to the cakes and coffee on Thursdays, and to celebrations of a paper published. Groups would go out to lunch or gather in the cafeteria right in the Business School (where i would go down for some extra dark chocolate as an afternoon treat). Above are photos that I took on just one day in mid-March in Gothenburg while taking in some fresh air and exercise before going to the Business School. I have posted some additional photos here. Congratulations to the 2012 SIAM Fellows! Having received a PhD in Applied Mathematics from Brown University, with a specialization in Operations Research, I have been a member of quite a few professional societies from INFORMS and POMS to the Econometric Society, the Regional Science Association International, the Society for Computational Economics, and, of course, the American Mathematical Society (AMS), and SIAM (the Society for Industrial and Applied Mathematics). I also belong to various special interest groups within certain societies in both INFORMS and POMS that focus on transportation and logistics, computing, and humanitarian operations. Being a member of a professional society is very important since one gains a community of interest and expands one's disciplinary connections as well as personal ones. I was delighted to see the new list of SIAM Fellows, which included several well-known operations researchers, including Don Goldfarb of Columbia and Bob Vanderbei of Princeton and, if I may say, a fellow PhD in Applied Math from Brown, Thaleia Zariphopoulou. Thaleia and I shared a room a while back at the INFORMS Conference in Orlando, and we had a fabulous time. She is now a chaired professor at Oxford University, having been previously at Wisconsin and Texas Austin. She has done outstanding work in financial mathematics. I was also thrilled to see at the top of the list Tamer Basar from Illinois. I last saw Tamer at the NetGCoop Conference in Glorious Paris back in October, when I gave a keynote talk. He was the General Chair of this fabulous conference. You may see the entire list here (and, last but not least, given her surname, you will find Thaleia). Congrats to all the SIAM Fellows on an honor richly deserved. It is especially nice to see familiar faces! Today was another big occasion to celebrate and the photos above depict this special day. My doctoral student, Min Yu, successfully defended her dissertation, ANALYSIS, DESIGN, AND MANAGEMENT OF SUPPLY CHAIN NETWORKS WITH APPLICATIONS TO TIME-SENSITIVE PRODUCTS, at the Isenberg School of Management at UMass Amherst. She is the 16th doctoral student, whose dissertation I have chaired. Min had a fabulous dissertation committee consisting of Professors June Dong, Mila Getmansky Sherman, and Christian Rojas, from whom she learned so much. her concentration was in Management Science with a minor in Resource Economics. Her PhD is in Business Administration. The abstract of Min's dissertation is below. With supply chains spanning the globe, and with increasing time-sensitivity for various products in many markets, timely deliveries are becoming a strategy, as important as productivity, quality, and even innovation (see, e.g., Gunasekaran, Patel, and McGaughey (2004), Christopher (2005), and Nagurney (2006)). the demand for it is sensitive to the elapsed time for the order fulfillment; the failure to satisfy the demand on-time may result in the loss of potential market share, or, even worse, additional injuries or death as in times of crises. This dissertation formulates, analyzes, and solves a spectrum of supply chain network problems for time-sensitive products, ranging from fast fashion to food to pharmaceuticals. Specifically, I first develop a model that captures the trade-o s between the operational costs and time issues in the apparel industry. I then construct a sustainable fashion supply chain network model under oligopolistic competition and brand differentiation. I, subsequently, capture the deterioration of fresh produce along the entire supply chain through arc multipliers with time decay. Finally, I consider the supply chain network design problem for critical needs products, as in times of crises and humanitarian relief operations. I also develop a supply chain network design/redesign model with multiple products, with particular relevance to healthcare. structures, and efficient and effective solution. I am very much looking forward to the Graduation Ceremonies at UMass Amherst on May 11, 2012! I have recently returned from two weeks in Sweden and I miss Sweden already. I even miss the food, which was fabulous and tasted better than that in the US. I enjoyed the meals in the cafeteria at the School of Business, Economics and Law at Gothenburg University, where I sampled several lunches (and sneaked down for some dark chocolate as well) and the food in the cafes, bakeries, and the restaurants. During the two week period I dined on Swedish, Turkish, Italian, Indian, French, and even Polish cuisine.From my colleagues I learned about the big fresh produce auctions in Amsterdam but that bananas get shipped directly to Sweden. Just before traveling to Sweden in mid-March, my doctoral student, Min Yu, and I finished the paper, "Competitive Food Supply Chain Networks with Application to Fresh Produce." In the paper, we model the deterioration of fresh produce over time and under different storage and transportation conditions. In the network model, we also capture the discarding costs associated with the disposal of the spoiled food products and allow for product differentiation. We utilize variational inequality theory to formulate the game theoretic problem in which the firms compete until a Nash equilibrium is attached. A case study in our paper focuses on the cantaloupe market, in which we analyze different scenarios prior to, during, and post a foodborne disease outbreak. Dr. Maria Klawe, the President of Harvey Mudd College in California, has created initiatives for enhancing the climate for computing. She is a native Canadian (like I am) and holds a PhD in Mathematics and was also working on her PhD in Computer Science at the University of Toronto, when she was offered a faculty position there. In 2002, she moved to become Dean at Princeton University of its school of engineering and applied sciences (coincidentally, Harvard has a similar school and its present dean is also a female, Cherry Murray). This time, her husband followed her and, before long, her administrative skills were recognized and she was regularly recruited. The opening of the Presidency of Harvey Mudd College caught her attention -- she applied and in three years has made major inroads, both in terms of financial fund raising as well as academic and intellectual leadership. Partially, through her efforts, the introductory course in computer science at Harvey Mudd has now been redesigned to make it more welcoming and "fun." In addition, she has secured funding for about 100 female students to attend the Grace Murray Hopper annual conference, named after the legendary female and computer programmer. The article in The New York Times also discusses whether such ideas are scalable to other universities and colleges. We need to nurture the intellects of all, and to create opportunities and support for all, especially in our technology-driven society. Without mathematics, operations research, computer science, engineering, and, of course, algorithms, implemented in software, coupled with the best of the social and behavioral sciences, the many problems that we are faced with today will not be solved. You can read more about Dr. Maria Klawe, my exploits at the World Science Festival in NYC, and activities of female mathematicians in this edition of the Association for Women in Mathematics Newsletter. In the Loop, which is a University of Massachusetts online publication that goes out regularly to faculty and staff, has nice coverage of the visit of three Isenberg School of Management faculty members to the University of Gothenburg, Sweden, last month. Above is a photo of the three of us: Professor Linda Smircich, yours truly, and Professor Marta Calas. We all have offices on the third floor of the Isenberg School but Linda and Marta had no idea that I would be at the School of Business, Economics, and Law at the University of Gothenburg during the same period of time as they. I had no inkling that they would be there either. The article talks about how Linda and Marta have had a long association with this university, whereas this was my first trip there as a Visiting Professor of Operations Management. I happened to come across Linda and Marta at the business school in Sweden, where the photo above was taken. Note -- we were all wearing green (great minds do think alike). I miss Sweden already and am looking forward to being back in June. Yesterday, I had the pleasure of introducing the outstanding tutorial presenters at the Social Computing, Behavioral-Cultural Modeling, and Prediction Conference (SBP 2012) at the University of Maryland College Park. The tutorials were given by Dr. Kathleen Carley (Dynamic Network Analysis), by Dr. Hyam Hirsh (Crowdsourcing, Human Computation, and Collective Intelligence) and by Dr. Patty Mabry and Dr. Nate Osgood (Public Health Concepts: An Introduction to Modelers). The audience learned so much from these truly informative tutorials and, as the tutorial chair, I would like to thank the tutorial presenters for the breadth and depth of fascinating information that they delivered yesterday. I am hoping that we can post the slides from the tutorials on the conference website and will let you know if/when this is done. The day flew by much too soon, and all those in the audience were treated to an intellectual feast on some of the most timely research topics today. Above are some photos taken yesterday at the SBP 2012 conference. I had to return early, since I was committed to doing a TV interview today for a PBS Channel and the program Connecting Point. I will let you know when the interview airs. It was motivated by the upcoming PBS production America Revealed, for which I was interviewed by Yul Kwon, for an educational segment on transportation and the Braess paradox. The month of March is when applicants hear of decisions as to their school acceptances, whether by high schools, especially private "prep" schools in the U.S., many of which are elite boarding schools, as well as colleges and universities. Three years ago, I was speaking in Vienna, Austria, and my family had joined me. We had revisited Innsbruck, Austria, where we had lived when I was on a Fulbright, and then traveled by train to Vienna where I was speaking on global supply chains at the Vienna University of Economics and Business. While in that gorgeous city, my daughter received notices of admittances to two private schools in the U.S. She was going to be a day student wherever she went since we live in Amherst, Massachusetts and there are enough good schools in the area. When we returned to the U.S., as I was showering, she checked the mail and there was the letter of acceptance from Deerfield Academy (DA). Having attended the wonderful Bement School in Old Deerfield from kindergarten through 9th grade, she had learned how to swim at DA and had even had track meets and field hockey games there. Moreover, she had attended the DASAC arts summer camp there. We visited again all the schools that she had been accepted to, and the second visit day at DA (one of these took place again last Friday at which my daughter was a day student representative panelist) , among other experiences, people, and data, convinced Alexandra that DA was the school for her. She has loved the education that she has received and the friends that she has made at DA. The Atlantic has an article on how the Chinese from the mainland have discovered U.S. private schools and Deerfield is singled out in the article, along with the mention of the admissions director, Ms. Gimbel. Even in elementary school at Bement, my daughter had female classmates who were from China and Korea. The article, written by Helen Gao, who is herself a Deerfield Academy graduate, is titled: "How China's New Love Affair with U. S. Private Schools is Changing Them Both." In the article, a Chinese mother, Zhang, hopes that her early efforts will lead to a good life for her son, which she believes lies in America. She mentions the country's more leisurely lifestyle and its comprehensive healthcare system. But its greatest promise, she says, is the culture of fairness, which rewards diligence and talent first. "In China everything is based on connection. Things like getting a promotion depend on too many factors. In America, as long as you work hard and deliver results, you will distinguish yourself." Not only are U.S. private schools now international magnets and, one must remember, that there is only so much capacity in them, but the US colleges and universities are as well. I do not envy the hard-working high school student with all the challenges today and pressure to succeed and all the competition, which has become international. When students with 8 AP courses and grades of 5 on all such exams get rejected from elite colleges, I truly wonder. But then again, it is, ultimately, what you accomplish after you receive your education that matters and the mark that you leave on the people, your community, and the world. Next Friday, one of my doctoral students, Min Yu, who is from China, will be defending her doctoral dissertation on time-sensitive supply chains at the Isenberg School of Management at UMass Amherst. She is an outstanding student and scholar with an exceptional work ethic and generosity of spirit as well as kindness and thoughtfulness -- all of which will serve her well as she assumes a faculty position in the Fall.